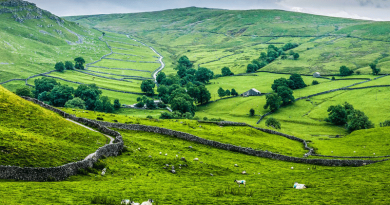 The Peak District features an idyllic landscape of wind-swept moorland and plush green valleys. The Peak District National Park covers a large swathe of the region and is over 500 square miles. This is where the Pennine Way begins – a 250 mile track that runs along the Pennine Chain towards the Scottish Border. 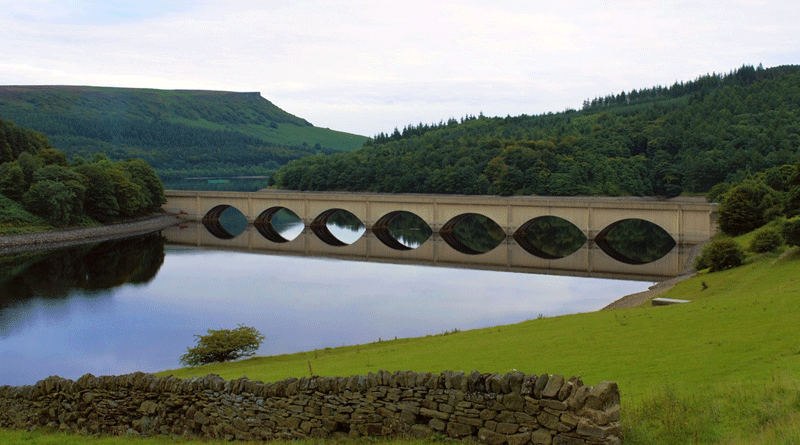 The Peak District also known as adventure country and is perfect for walking, hiking and climbing. 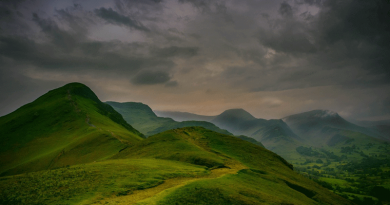 The Castleton and Hope Valleys also provide the opportunity for pot holing with a large network of underground caves and tunnels in the area. Towns worth seeing include Glossop, Matlock and Buxton. The latter, a spa town is considered by many to rival Bath with its beautiful Crescent and hot spring. Its history dates back to Roman times – the mineral water company Buxton was founded here. One can also find a plethora of hamlets dotted around. Baslow is a good example, with its stone bridge, as well as the neighbouring village of Bubnell. The nearby Abney is typical of Derbyshire, surrounded by wild, rugged moorland country. Historical attractions include Chesterfield’s Crooked Spire, Sudbury Hall and Tutbury Castle, where Mary, Queen of Scots was imprisoned. Bakewell’s neolithic stone circle and monuments are also important sites. Peak Tours delivers hired bikes to any venue in the Peak District and offers friendly guidance and advice. Other outdoor centres include the Derbyshire Angling Club in Alfreton and the popular sailing club at Ogston Reservoir. There’s also the Wild Park Leisure Centre that caters for Paintballing enthusiasts – it’s about ten minutes from Derby City centre. There are countless idyllic towns and villages to be found in and around the Peak District Region. Here are our favourites. Ashbourne is a market town located in the county of Derbyshire. Considered to be the Southern Gateway to the Peak District, it is an historic town with cobbled streets and well-preserved Georgian buildings. Originally a small Saxon hamlet, Ashbourne began to flourish and grow during the 18th century and was a meeting point for a number of coaching routes. It has over 200 listed buildings including a range of old coaching inns like the Green Man and Black’s Head. Church street has a selection of historically significant buildings including The Mansion and the 13th century St Oswalds Church which has a 200ft spire. Ashbourne’s cobbled market place is the town’s central meeting point – market days take place on Thursday and Saturdays. It can be reach via Victoria Square, which was once known as The Shambles. This area of town boast a variety of shops and antique outlets and there’s also a collection of pubs and bistros found dotted around the market square. The Shrove Tide Football Match, one of Ashbourne’s most famous customs, takes place annually. Contested by the Uppards and Downards, the object is to ground a leather ball in one of two goals that lie 3 miles apart. It is a particularly rough game but has been a local tradition for hundreds of years. Bakewell is a small market town in Derbyshire. Set in the Peak District National Park, it is surrounded by densely wooded hills which stretch to high windswept moorland – it is a highly suitable destination for those seeking to get away from it all. For information regarding Bakewell cottages see our accommodation information below. Bakewell Dating back to Saxon times, Bakewell has a selection of notable historic landmarks; its arched and buttressed bridge is over 700 years old and spans the River Wye. The Old Market Hall, which is still used today, dates back to the 17th century and compliments the slightly unusual brownstone buildings found throughout the town. All Saints Parish Church, with its octagonal tower, is another notable attraction and was originally built in the 13th century. It still retains fragments of Saxon and Norman stonework. The local market takes place on Mondays and is held at two sites; the agriculture building which hosts the cattle market and the town centre where a stall market is held. Other events take place all through the year including the popular Bakewell Show and Carnival Week, which is held in July. Castleton is a large village that lies at the Western entrance of the Peak District’s Hope Valley which sweeps down to the Yorkshire border. Near Castleon’s village green lies Peveril Castle. Dating back to Norman times, it affords some impressive views of the surrounding countryside and is protected by the English Heritage. Lying underneath the castle is Peak Cavern, one of many underground caves found in the area. It’s mouth is the largest in Britain and leads to a number of rock chambers such as Devil’s Cavern and the Orchestral Chamber; known for its acoustic properties. Mam Tor, is about a mile west of Castleton and stands at 1697ft. It’s also known as the Shivering Mountain due to the effects of erosion, which causes shale to fall into the valley below. At its summit lies an Iron Age fort. Garland Day is Castleton’s most important annual event and takes place during the latter half of May. A Garland King, made from a wooden frame is covered with flowers and paraded through the town on horseback, accompanied by morris dancing in the Castleton market place. The custom, which has endured for hundreds of years, celebrates the restoration of the monarchy in England and Ireland. Matlock is situated on the outskirts of the Peak District in Derbyshire. Set on the River Derwent, it is the county town of Derbyshire. 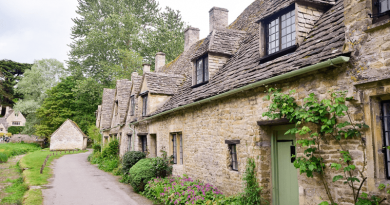 If you’re looking for Matlock cottages then our properties listed below may be suitable. Originally a collection of small hamlets dependant on agriculture and farming, Matlock established itself as a major spa town thanks to the establishment of Hydrotherapy by John Smedley. It became a popular centre for the treatment of ailments with water therapy during Victorian times, which was further enhanced by the introduction of railways. Now tourism is Matlock’s most successful industry. The town is set among woodlands and hills with dramatic views of the surrounding peaks and crags of the Peak District. The Heights of Abraham, over 700ft above the town, are said to have been named by an officer who fought under General Wolfe, because of their resemblance to the heights scaled in the capture of Quebec. A selection of impressive show caves can be found in the vicinity of Matlock as can the ruins of Riber Castle, which stand on a hillside above the town. There are good shopping facilities in the centre of town and the Hall Leys Park provides a variety of facilities including a miniature railway, tennis and a small boating lake. View Our Hand-Picked Collection of Peak District Holiday Cottages.